I haven’t gone gluten, or dairy free. I am incredibly fortunate that I can, thus far at least, eat what I want. And I do. Last night I stuffed my face with cheesy Wotsits (I love a flourescent food stuff sometimes). Today, for the first time in eight years, I went into a supermarket and bought a loaf of white sliced and we had toasted sandwiches for Sunday lunch. But generally, I do eat really well and also, I do like to try new things and double-also I like to have a little biscuit or something every day, and it kinda helps, now that I’m no longer 19 years old and seven stones, to think of my health ‘n’ stuff. So I found these in Hugh F-W’s new book Light and Easy (which thus far I really like although have only tried a few things). They are choc-full of good-for-you ingredients, have no refined sugar, no dairy, no wheat, no gluten and although they absolutely won’t be to everyone’s taste, they are to mine and also my youngest loves them (incredibly). They are not overly spicy or gingery, and make a great little snack when you need a treat. But are also – thanks to the fibre and protein – rather satisfying and sustaining. Oven to 170C. Baking parchment or magic carpet type sheet onto a baking sheet. Put the dates and ginger into a food processor. Not a blender, but a processor (it’s sticky and if you put this in a blender I wouldn’t want to be you cleaning up afterwards). Whizz up for a couple of minutes until the mixture is really sticky and everything is evenly chopped up. This is also the time you realise you have bought unpitted dates as the processor will start making an awful sound and then start smoking. When the mixture is all mixy, then you add the eggs and process again until you get a nice sloppy mixture – takes seconds really. Now add all the other ingredients and pulse for a few times until everything is, how can I put this? Mixed. You will have a very sticky dough. Either drop spoonfuls onto the tray or wet your hands slightly, roll into a ball and then flatten – which is what I do. I make mine about 5cm wide. They don’t really spread out so you can pack them fairly tight – but not touching – onto a baking tray. Top with flaked almonds if you so wish (this is my addition). I bake mine for 15 minutes and this is plenty. Hugh says 20. They should be golden but not too dark and have a ‘slight give’ in the middle. I can lift my straight off the tray, with my hands, onto a wire rack to cool. That’s it. Eat and feel virtuous. This entry was posted in Biscuits, Dairy Free, Gluten-free, Picnics, Wheat free and tagged almonds, dates, ginger, ground almonds, no sugar, spices on February 23, 2015 by Annalisa Barbieri. Last year I was given some kefir from my friend Becky. Don’t ask me too much about kefir, cos I’m still learning about it. It’s basically something that looks like a small, glutinous brain, which you put in milk (I have milk kefir you can also get water kefir) and it does something to the milk after a day or so which you can then drink or put in smoothies and it has magical qualities. It doesn’t really taste great on its own. I originally started it because my eldest has eczema and it’s a battle to keep her probiotics/prebiotic level high (this is another, long story). But we channel Gwynnie whilst we imbibe it. The thing with kefir is that you get lots of it to use up. We can only use so much in smoothies so I started thinking what else could I do with it? And then I decided to put it into my sourdough. Not loads, but about 60g (that’s all I get per yield) of it which I used as part of the ‘water’ element (I add 335g of liquid to 500g of flour so my kefir takes up some of the 335g, make sense?) And it works really well. It gives the loaf a lovely rise and you get a wonderfully moist crumb – less air holes I find (see photo below, the main photo shows the crumb after the first slice when there are more air bubbles), but a really nice sourdough for making sandwiches. And it’s tasty. Really tasty. Again this adds a lovely dimension to the bread. I made some the other day with oats and my children said the bread was “particularly delicious”. I’ve also used kefir in place of buttermilk in my prune and almond loaf to great success. 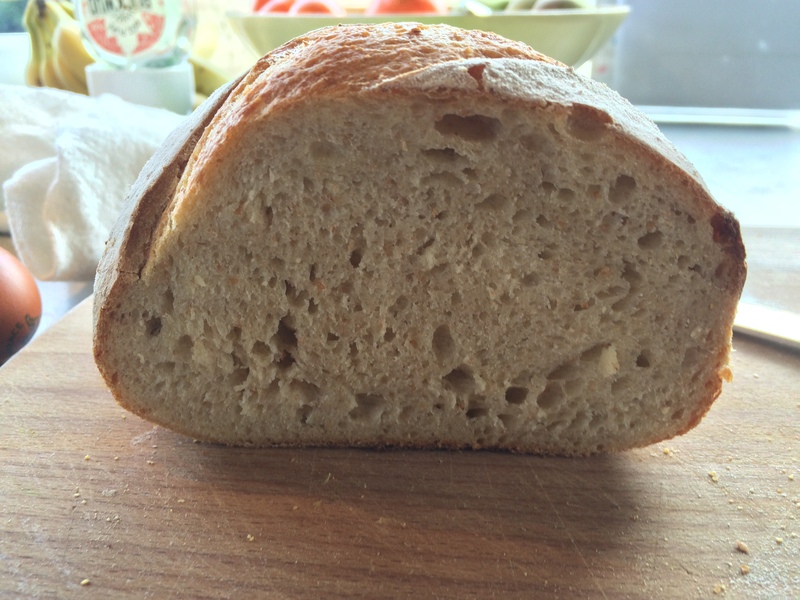 This entry was posted in Bread and tagged kefir, oats, sourdough on February 10, 2015 by Annalisa Barbieri. Swimming is a fairly big thing in our house. I don’t swim in winter, because I am a wuss. But my children do. In the summer, however, I swim every day. Sure you can wrap a towel round your head turban-style. But these (see links below) make the job so much easier, because you can fasten it up so it doesn’t fall off. Also of course, these are super useful every time you wash your hair. Especially now that I have LONG HAIR (almost). Indeed, I am actually writing this post with a turban on my head whilst my hair has a conditioning treatment on it. I must interrupt this post to tell you about the time I had to go to a party and face my nemesis, an ex girlfriend of my boyfriend who had caused a lot of trouble (this was the first and last time I ever let this happen to me). I took ages getting ready. And I thought I looked great. Except for one problem: I still had my hair all piled up on my head in a towel, turban-style. Without the turban it looked all wrong. Anyway, I went to the party – without a towel on my head – and I faced her and she was actually perfectly nice and we sort-of became friends. There is no moral to this story other than, sometimes, you can demonise people you’ve never met and there are very few people who don’t suit a turban. Don’t be tempted to buy cheap ones. I have an Aquis Lisse one, which is made of microfibre; I was sent it ages ago when I wrote about beauty. For an adult head I think they can’t be bettered. But they cost £15 odd. For children the Cuddledry ones, £9 odd, are perfect and well worth buying. Once properly secured they pretty much stay put. This entry was posted in Children, Consumer and tagged hair, swimming, towelling turbans, towels, turbans on February 9, 2015 by Annalisa Barbieri. The first time I made this, I made a mistake. I didn’t read the recipe all the way through. The recipe was just a collection of letters, made into words, that were irrelevant to me until I started actually making the cake when they became vital and important, a means to cake. And then I realised that the sugar quantity was meant to be split in two, 165g of which was meant to be added to the cake mixture and 135g was meant to be reserved for the drizzle. So I never did the drizzle part and, actually, that was the best (to me) version of this cake I’ve ever made. I’m not overly keen on sugary drizzle on a cake. I mean, it’s like the sugar fairy has pissed on a perfectly good cake. To me a cake should be soft, yielding, maybe creamy; but purposely moist – made moist – just confuses me. I think this is in part because there is an old Italian tradition, when eating stale bread, which is to wet it. A habit that I used to find abhorrent as a child, but then, I had that luxury, having not lived through a war. So now, I occasionally make this cake the proper way and sometimes make it my way. I give both versions below. It’s a lovely cake to have in, it lasts a good few days and you always have something for guests. But it’s not the sort of cake you want to eat loads of, it’s not a dangerous cake. And it’s the best version of this sort of thing that I’ve ever made/had. I think the addition of ground almonds gives it a certain substance, a certain meatiness. And I like that. It was from Delicious magazine a few years ago. Preheat the oven to 180C and line a 1litre loaf tin. MIx together the 165g of butter and 165g of sugar and beat until pale and fluffy. Mix in the lemon zest. Now beat in the eggs, a bit at a time, adding a spoon of flour as you go with each egg. Add the rest of the flour/bicarb/baking powder. Mix in the hot water, the ground almonds and poppy seeds and pour into the tin. Bake for 40-50 minutes. A tester pushed into the cake should come out clean. My oven is very hot so I check after about 38 minutes. Now, set aside to cool and that’s it if you are not doing the drizzle. If you are, then you now mix the lemon juice with the remaining 135g of sugar and heat in a pan until dissolved. Prick the cake all over whilst it’s still warm and in its tin (but has had about 10 mins to just chill) and then gently spoon the lemony sugar mixture over the top. This entry was posted in Cakes, Teatime and tagged cake, cake mixture, caster sugar, drizzle, ground almonds, lemon on February 5, 2015 by Annalisa Barbieri. I live in hope of finding some sort of cereal bar, that I can make, that my children will like. I think a good cereal bar is an excellent thing to be eaten when you don’t have much time, but need something that will keep you going. But so many bought cereal bars are full of crap. Many years ago, I co-ran a parenting website called I Want My Mum (because that’s all I said when I was pregnant and not long after having my baby, “I want my mum, I want my mum!” I would lament. Luckily she wasn’t far). I posted a recipe on there for some sort of healthy cereal, chewy bar. Loads of people went crazy for it, saying that their children loved it. Not mine. My children have never liked any sort of bar that I’ve made, but they look at the Kellogg’s Special K Raspberry and Chocolate bars with longing every time they go past them in the supermarket aisle. So I saw these in my Dale Pinnock Healthy Every Day book. He’s the one I got the chocolate/coffee smoothie idea from. I adapted his recipe, changing the proportions and also, he said you should sandwich the chocolate/peanut butter layer in between the layers of oats. But this didn’t look great to me, and also, in a bid to entice my children, I thought it’d be better to coat the whole lot in chocolate. I even wrapped them up in little bags to make them look shop bought. Did they love them? The ungrateful bastards. But I really like them (just as well as I have about 18 of them now) and if you need a healthy but delicious, quite treaty snack, you can try these. Or, if you’re lucky, your children might like them. Melt the butter, coconut oil and honey in a pan. Add a pinch of sea salt if your nut butter doesn’t have it. When melted, add the vanilla extract and the oats, and coat everything. In a bowl atop another pan of simmering water, melt the chocolate and nut butter. When melted, add to the oat mixture and stir really well. Tip into a tin (I use one that’s about 20cm square but you can see how much mixture you have so use a tin accordingly. I line mine with baking parchment to make thing easier). Then just chill for an hour or two, cut into slices and offer to your children and when they refuse, sit down and eat the lot yourself whilst writing them out of your will. This entry was posted in Children, Chocolate, Healthy, Picnics, School fete, Teatime, Wheat free and tagged butter, chocolate, coconut oil, nut butter, oats on February 3, 2015 by Annalisa Barbieri. Spanish folk: don’t judge me too harshly. I know this isn’t authentic. But it’s still delicious. I first ate paella when I went to Spain with my homegirls, aged 18. What a holiday we had. Insane. Six girls in a non-tourist region of Spain…there was this little restaurant which made absolutely fantastic paella. And chips. The best chips and the best paella. I absolutely adore dishes that you can eat with just a folk, and not have to worry about gristle or bones or fat or nasty bits. Okay so we did have to shell the huge prawns that sat atop their rice deathbed, but stuff like that doesn’t scare me. This recipe doesn’t use shell on prawns so you can sit, cross-legged on the sofa and eat this with one hand, preferably with a fork in it. Before this, I had never attempted to make paella at home. It seemed so scary, and it involved paella pans that you had to treat with love and care, lest they rust. Then I saw this recipe in Donna Hay’s Simple Dinners and we made it and we loved it. My children aren’t so mad on it, but the beauty of this dish (and oh there are so many beauties to it) is that you can pick out the bits you don’t like and eat those you do. This is the perfect dish for when you don’t really know what to eat (meat? fish?) and don’t have much time, but still want something relatively healthy and comforting. If you ate everything in it you could get those ‘seafood pie’ mixes from the frozen compartments. We don’t because my partner can’t eat bi-valves and those things usually have tons of mussels in them. But we did, as sharp eyed readers may note, add squid rings into this one. Don’t be tempted to use chicken breast meat, it’s all about the tasty thigh meat here. Heat a large, deep non-stick frying pan over a good strong heat. add the onion, chilli if using, paprika and chorizo and cook for 3-5 minutes until it’s all golden looking. Now add the chicken and cook for five minutes, turning it so that all sides get lightly browned. Add the rice and stir until all coated, now add the stock and bring to the boil and cook for ten minutes. Add the prawns and cook for a further five minutes until they are pink and the rice is tender. Serve with the coriander sprinkled on top and the cherry tomatoes and a lemon wedge each. This entry was posted in Dairy Free, Fish, What's for dinner?, What's for lunch?, Wheat free and tagged chilli, chorizo, coriander, one fork meal, paella, prawns, rice, Spain, teatime on February 2, 2015 by Annalisa Barbieri.